CEO Powercast co-hosts Charlie Fusco and Evan Morgenstein sat down with 2012 U.S. Paralympian Tanner Gers in the latest episode of their weekly podcast released Wednesday. With less than a week before the Olympics begin, spirits are high and controversy abounds. Episode 11 covers hot topics including the Rule 40 restrictions on athletes, the legacy of Oscar Pistorius and the realities that come with being an Olympic athlete. At 21, Tanner was in a severe car accident that left him blind and battling the harsh realities that come with such a life-altering event. Instead of shutting down, he made a conscious decision to go all in in every aspect of his life from that moment forward. He went on to win the Gold Medal in the long jump at the 2012 Paralympic Trials before representing the U.S. at the Paralympic Games in London that summer. He has since become the popular host of his own podcast, The Creative Success Show, and a successful corporate consultant helping young entrepreneurs and businesses tap into their own creativity. “Tanner has so much to offer entrepreneurs in terms of indomitable spirit,” said Fusco. Tanner’s background made for some great conversation this week on the growing controversy surrounding the far-reaching restrictions placed on Olympic athletes and how he has managed to build and grow his audience through motivational speaking and podcasting. He also provides some great tips on planning and time management that can help any athlete, entrepreneur or active individual maximize productivity each day. 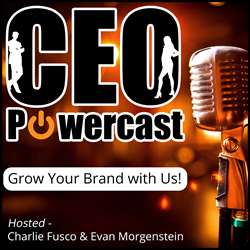 Listen to Episode 11 of CEO Powercast available now at http://www.ceopowercast.podbean.com and subscribe to the podcast on iTunes to automatically receive new episodes to your phone, tablet or PC. Synergixx, LLC is a creative think tank leading the way in merging traditional and online direct to consumer health and lifestyle product and service marketing strategies on TV, radio, print and online. The firm handles all media buying internally, and has an in-house, 24-7 sales and customer service call center for immediate fulfillment when clients’ products or services are advertised. For more information, visit http://www.synergixx.com.